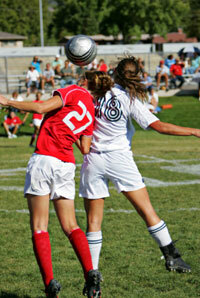 Concussions & Girls: Soccer is the source for most girls’ concussions. In high school sports, girls’ soccer is the second highest source for concussions among all athletes – with 36 injuries per 100,000 players. Only high school football has more: 47 injuries per 100,000 players. The source of most girls’ concussions: colliding with another player or the ground. A header is not the major source; the impact with the ball is not sufficient to injure. However, many collisions occur when two girls are trying to head the same ball. Additional studies show that girls are more prone to concussion and take longer to recover. The Blue Lake take on it: You might think your daughter should avoid sports after reading coverage about girls’ concussive injuries. But, like so many things, injuries are still relatively rare, and if your daughter loves sports, it would be a mistake to take her away from that. Instead, make sure you and your daughter understand the most common injury-inducing maneuvers, and use protective gear where applicable. Many people believe that if they give their children food that is less heavy in calories, they will snack more later, and so eventually take in those calories regardless. A study by the Obesity Society reported that is not true. For one week, a group of kids was given breakfast, lunch, dinner and snacks, and the next week, they received the same menu and portions, with lower calorie substitutes for milk, fruit and pasta sauces. As long as the volume of food stayed the same, the children were no more likely to snack during the week of eating fewer calories than during the high calorie week. We are reminded of the old phrase used to describe “hearty” food: It really sticks to the ribs. Well, it seems it really just sticks to the stomach! If your child has any issues with weight, you would be doing him or her a big favor by trying some of the substitutions that worked in this study. 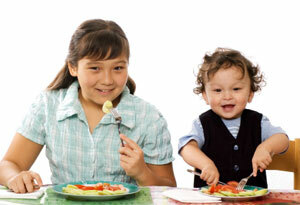 And don’t do it secretly – kids are capable of learning with you about what works to keep weight off. Taking your family down the organic highway can be time consuming – and expensive. Wouldn’t it be nice to apply the 80/20 rule here? It turns out you can. If you buy organic options of just the five items below, you will have gotten the most benefit with the least effort. Why? These are the most common kid foods in which the organic version is significantly less toxic than the non-organic option. Many foods, including broccoli, onions, and foods with peels like avocados, bananas and oranges, come to market with much less pesticide residue even when they are not grown organically. We love this type of thinking. You don’t have time to keep up on every bulletin or develop a 10-page plan for strategic grocery shopping. 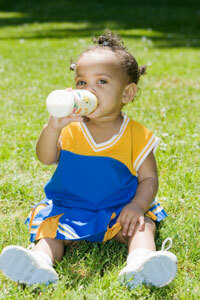 Thank you, Dr. Alan Greene, the author of Raising Baby Green, for this simple guideline. If you want to read more on this topic, and see some interesting parent responses, visit Tara Parker-Pope’s blog in the New York Times Health section. 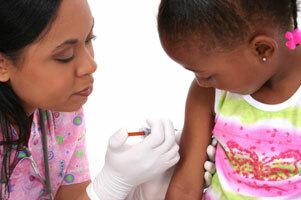 Vaccines: New Studies Show They Are Safe, And They Are Working. A pair of unrelated studies were published in September. Both of them brought good news about the safety and efficacy of vaccines in young children. UNICEF reported that annual child deaths fell below 10 million for the first time since records have been kept. As they point out, 9.7 million deaths of children under 5 years is “unacceptable.” But the trend is good. Most of these deaths occur in South Asia and Sub-Saharan Africa, and they are preventable. Much of the credit for the recent good news is the success of measles vaccination programs around the world. Add to this that the Centers for Disease Control and Prevention examined the records of more than 1,000 children who were exposed to thimerosal in the 1990’s and found no link to neurological problems. There will always be lingering doubts about vaccines – and this will always be a highly charged topic. The CDC study above did not examine links to autism. A separate study on that issue is expected in one year. A good source for reasonable advice to parents on vaccine safety is the American Academy of Pediatrics. The CDC also has an interesting comparison of the risk from vaccine vs. contracting a preventable disease. 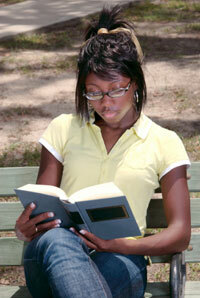 Scams in Student Loans and Study Abroad – Should You Care? In August, we found out that financial aid offices at universities were getting paid by student loan providers for creating a situation in which prospective students saw limited loan options. Later in the month, one of my favorite New York Times investigative reporters, Diane Jean Schemo, wrote about a similar market-fixing situation among popular “study abroad” programs. In some cases, it is charged that colleges received cash rebates for restricting a student’s choice of international programs to the chosen few. While the office of the New York Attorney General investigates these alleged misdeeds, the major industry trade association is starting to make noise about writing guidelines and self-regulation. A victimless crime? I don’t think so. Student loans and study-abroad programs seem like “good” things – all “good” parents want their child to get a higher education, and if the university has hand-picked these providers of student loans and semesters in Europe, why should they challenge them? Yes, there are much more serious white-collar crimes out there, but it really gets under the skin when the deception is practiced by those in the education arena. If you want to read about what happens when students are steered toward private loans with hard-to-discern interest rates, Schemo uncovered some gems. Maybe it’s time we realize that higher education, like health care, is an industry that has long since moved on from its “not for profit” roots.